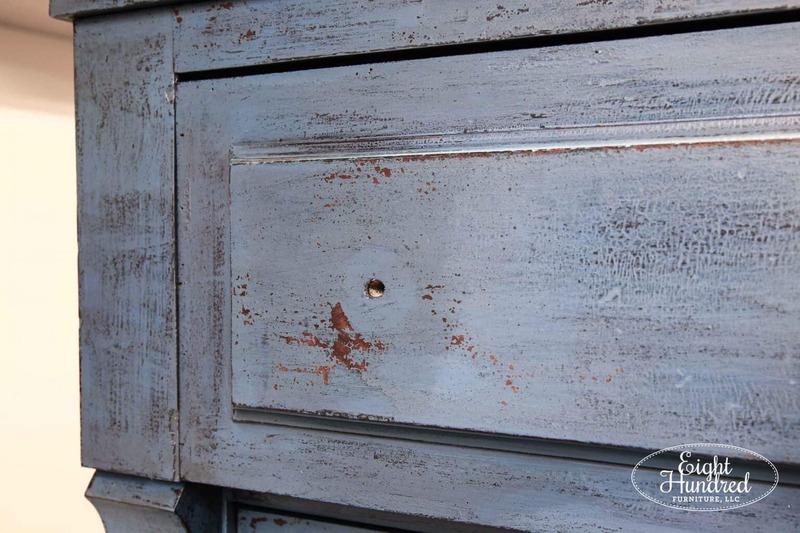 At this stage, I had sealed it with Hemp Oil by Miss Mustard Seed’s Milk Paint. Since my last social media posts, I have received a TON of questions about Hemp Oil. This tells me that folks are super curious! So let’s dive into that topic a bit more. 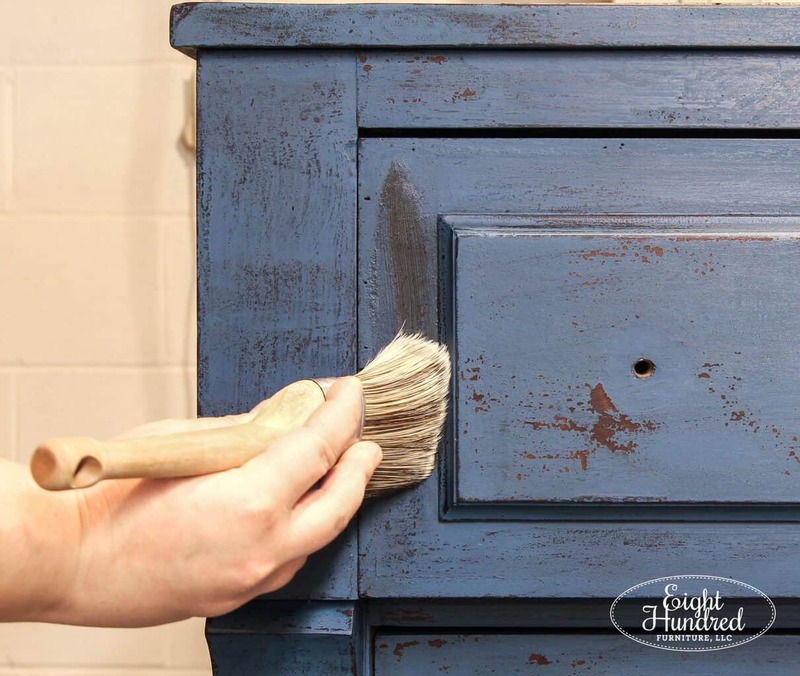 When it comes to sealing and protecting a piece of furniture after you’ve painted it with Miss Mustard Seed’s Milk Paint, you have a few options. There are liquid finishes (Hemp Oil and Tough Coat) and wax finishes. Two of the waxes are clear (Furniture Wax and Beeswax). Three are colored/tinted (Antiquing Wax, White Wax and Zinc Wax). Some of these products can be combined and applied on top of one another. This can be done for decorative purposes i.e. adding White Wax over Zinc Wax. Or it can be done to add more protection i.e. topping Hemp Oil with clear Furniture Wax. 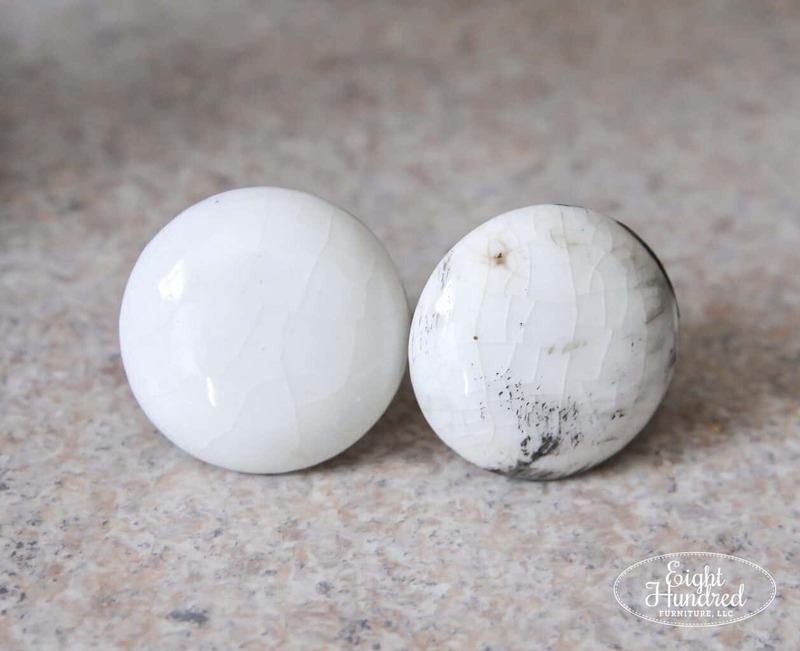 How, why and when you combine finishes depends on the look you’re going for and the kind of protection you’re going to need on your piece. For my dresser, I combined Hemp Oil and Antiquing Wax. My reasons were decorative. As my first layer of sealer, I used Hemp Oil. Hemp Oil is a natural oil that is cold pressed from hemp seeds grown without the use of pesticides. It’s processed and bottled to be a wood finish. Hemp Oil offers a low to medium level of protection. 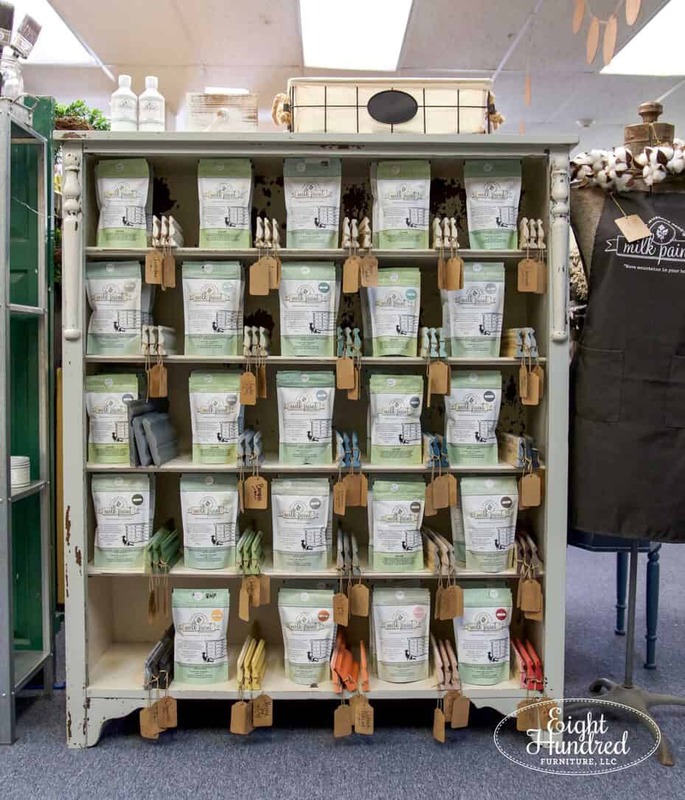 It can be applied on raw wood or over paint. 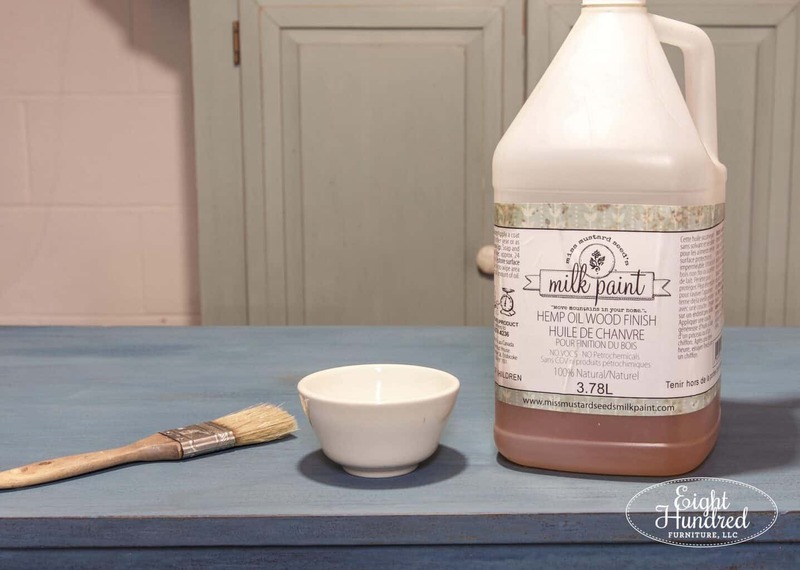 Hemp Oil is suitable to use over both milk and chalk paint. It’s food safe, but not food grade. You can use it on surfaces that will come in contact with food, but it should not be used to cook with or applied topically on your hands. You brush or wipe it on, let it sit a minute or two, wipe back the excess and let it cure 20-30 days. Use a lint-free cloth. You should keep textiles and linens off of a Hemp Oiled surface for 20-30 days so the oil doesn’t get on the fabric. It’s not a hard drying finish like Tung Oil. It is not meant to be used outside. 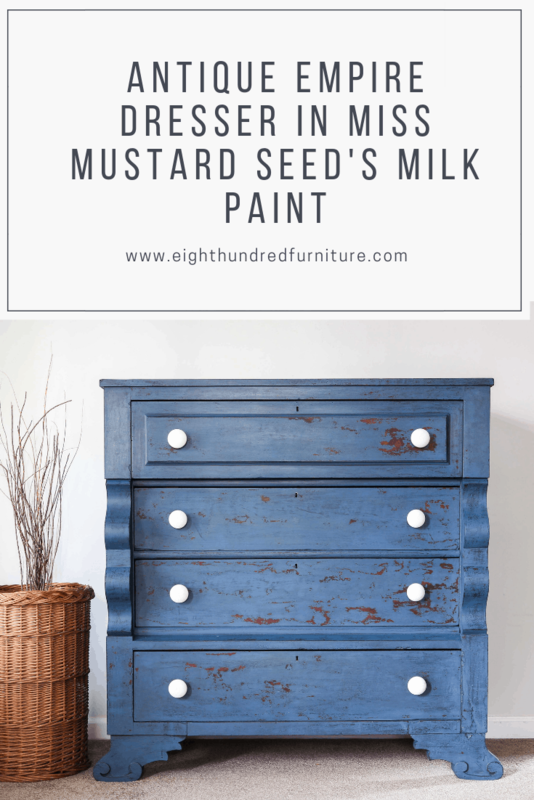 It absorbs the deepest into the surface and makes Miss Mustard Seed’s Milk Paint look the richest/darkest. When applied over whites and creams, it does not make them yellow. Hemp Oil can range in color from deep green to light yellow. This is due to the different pressings that are bottled. The difference in color does not impact how it performs. You can top it off with a wax product but you don’t NEED to. You cannot apply a water based finish over Hemp Oil. If you seal something with Hemp Oil and you want to paint over it, you need to wait 20-30 days for it to cure before you paint over it. I picked Hemp Oil to seal my dresser because I wanted the layers of Artissimo and Flow Blue to be their richest and darkest they could be. 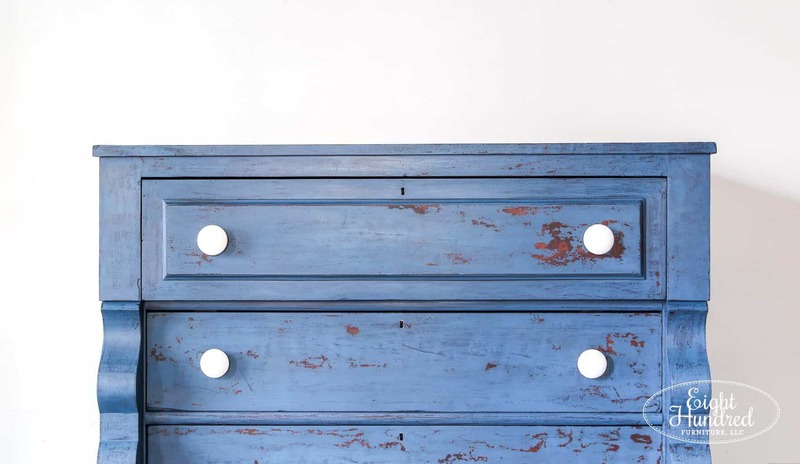 Plus, I also wanted to add some much-needed hydration to this dresser. 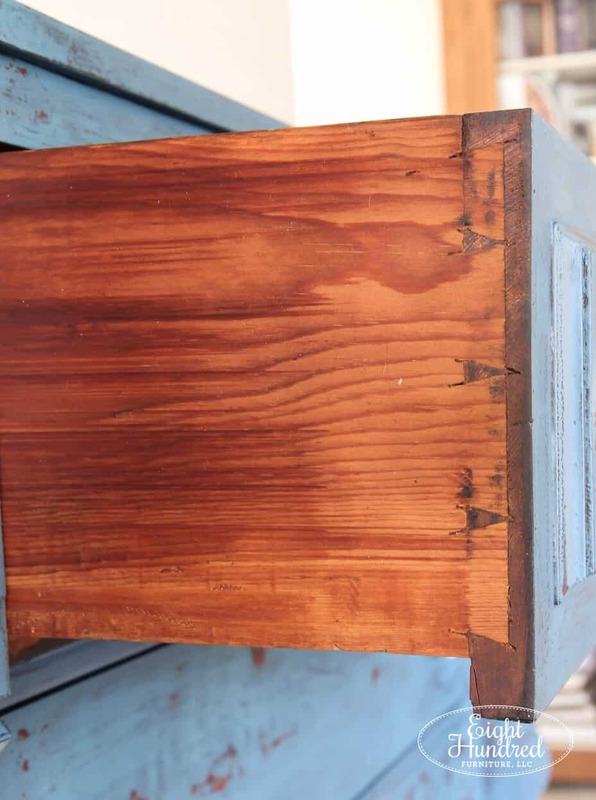 It was incredibly dry and had not been treated with any sort of wood oil in a long time. Hemp Oil by itself is a perfectly durable finish for this piece. It offers low to medium level protection, which is fine for a piece that will receive most of its use on the drawer areas. The only reason why I went a step further was to add a more decorative finish. Hemp Oil made my dresser look amazing, but I wanted more age and patina, so I added a layer of Antiquing Wax over the Hemp Oil. I applied the Antiquing Wax with a bushy brush. You could immediately see how it added a lovely antiqued darkness. I worked in small sections and wiped away the excess with a lint-free cloth. The effect was absolutely lovely and just what I was looking for. 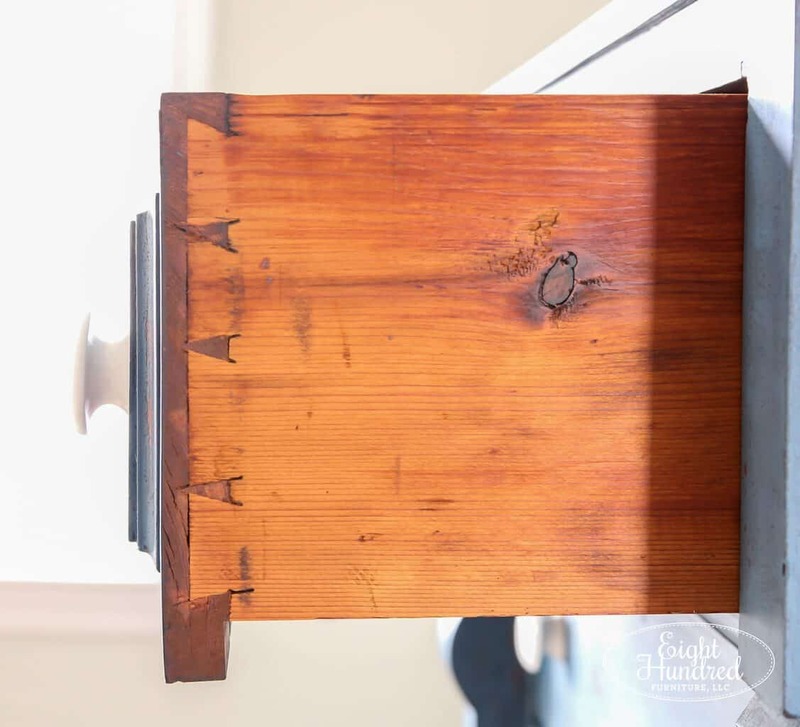 If you want a more in depth tutorial on how to apply Antiquing Wax, you can check out my blog post here. 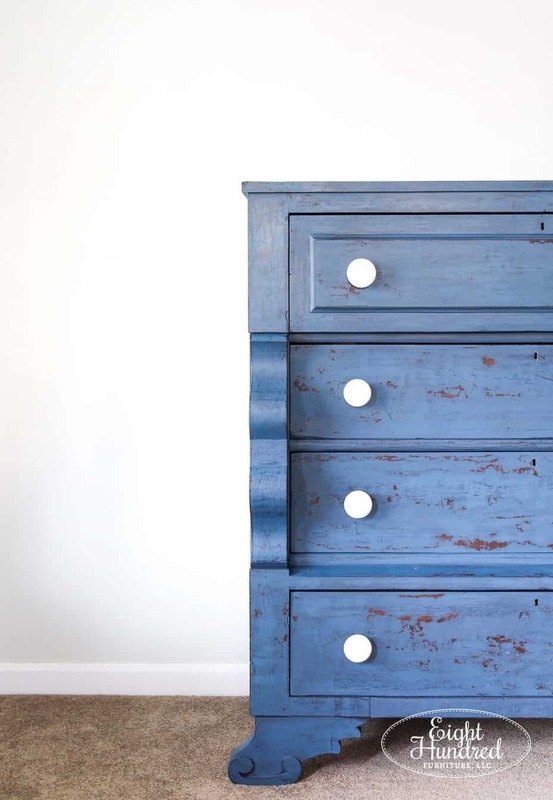 Once my empire dresser was finished, I had to stage and photograph it quickly! A piece had sold in my room at Homestead Studios, and this pretty piece needed to take its place in time for a busy weekend of shopping. 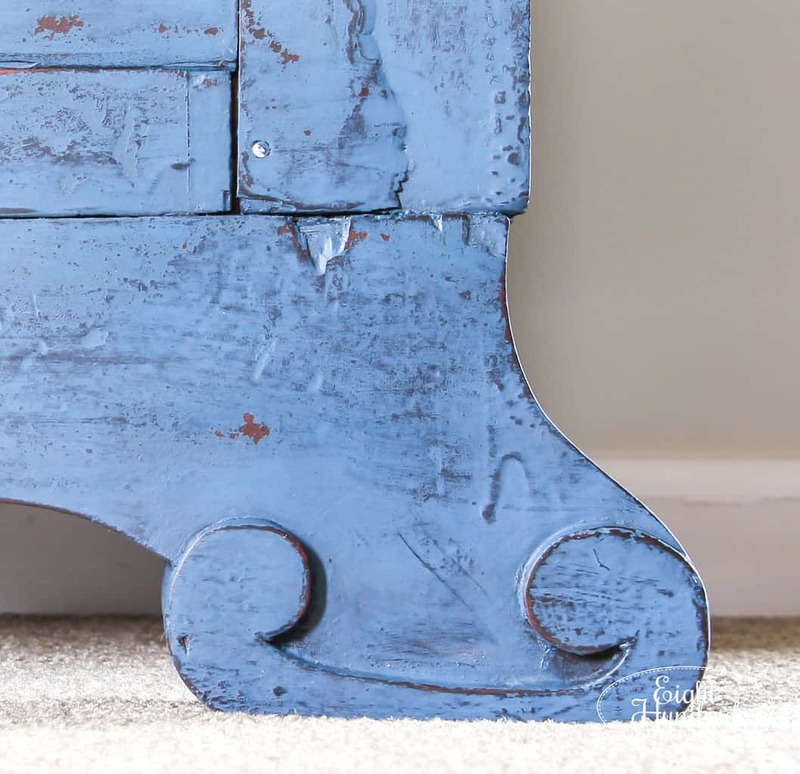 It’s funny, the more I paint furniture, the more I want to keep my staging simple and clean. I think the focus should be on the piece, not the accessories. 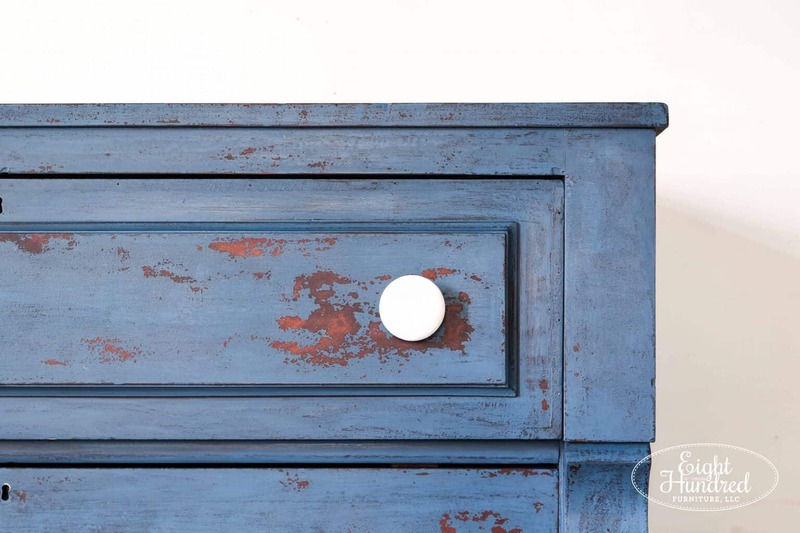 I absolutely love how the bright white (and now clean) porcelain knobs pop against the layers of Flow Blue and Artissimo Milk Paint. The random chippy patches I got were also a welcomed addition of character. This piece is easy to savor. There are beautiful details all over every single square inch. 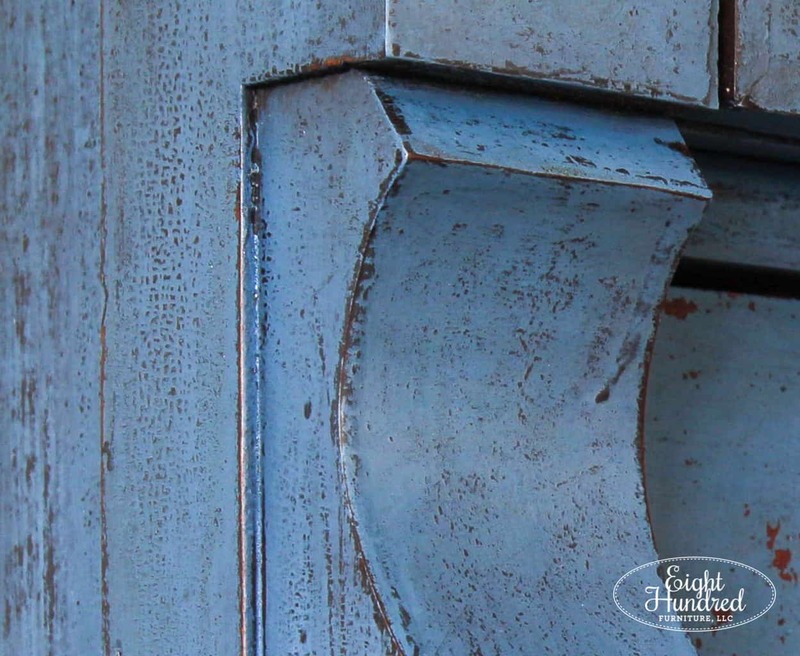 This shot is probably my favorite because it shows you everything – the layers of paint, the texture of the original finish, the gatored spots, the pieces of chipped veneer, the spots where the Antiquing Wax settled, etc. The sides are my favorite too. Just look at that texture. You can’t replicate that in a furniture factory. That only happens naturally over time. Even the inside of this piece is pretty! I took my sander and cleaned up the drawers. There were drip marks where stain was not wiped away, caked on patches of poly and years of dirt. It all came off with a good sanding and a thorough slathering of Hemp Oil. 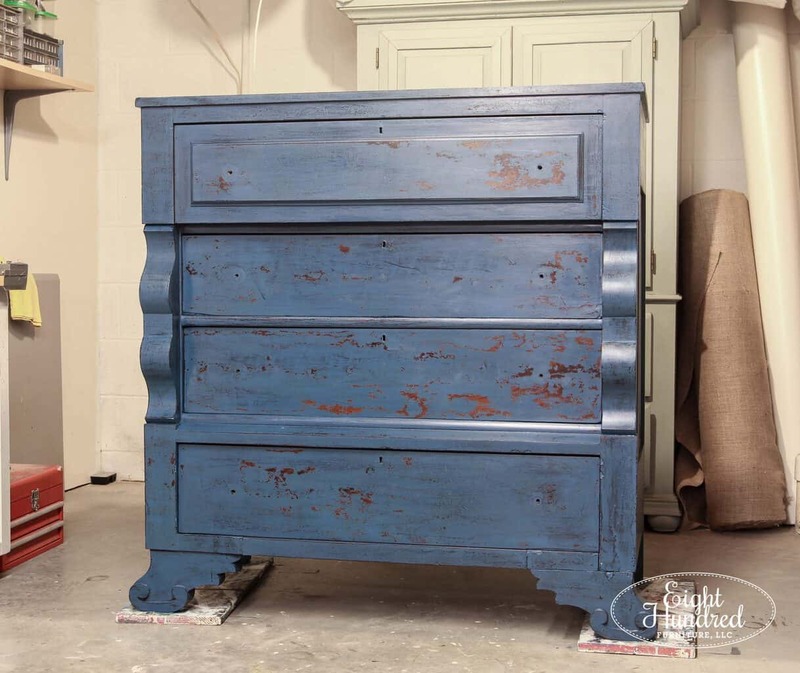 If you’re interested in purchasing this empire dresser, it’s currently available for $385 at Homestead Studios. It measures 42.5″ long, 44.5″ tall and 21″ deep. 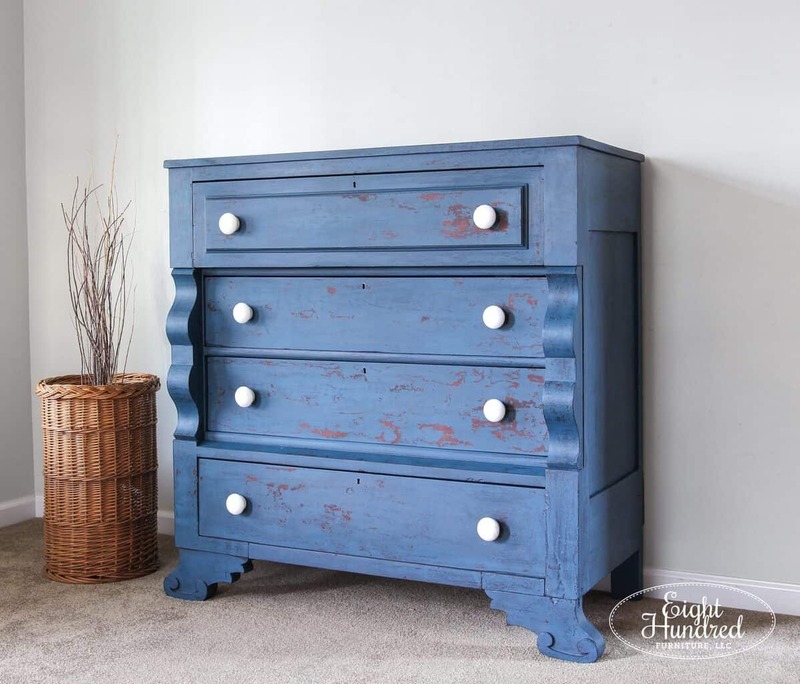 If you want to replicate the look I created on this empire piece, you can shop for the Miss Mustard Seed’s Milk Paint products I used from my display there and at Morgantown Market. I so love this piece and the color layering! I’d like to thank you for showing the dresser side photo (as well as the bottom right portion where more of the character lie 🙂 ). I have a pair of vintage bentwood bistro chairs that have this black bumpy alligator thing going on (something else I learned from you – they’re called “gatored” spots (which makes sense!)) and I was kind-of dreading having to hand sand it off (lots of curved pieces on these chairs). 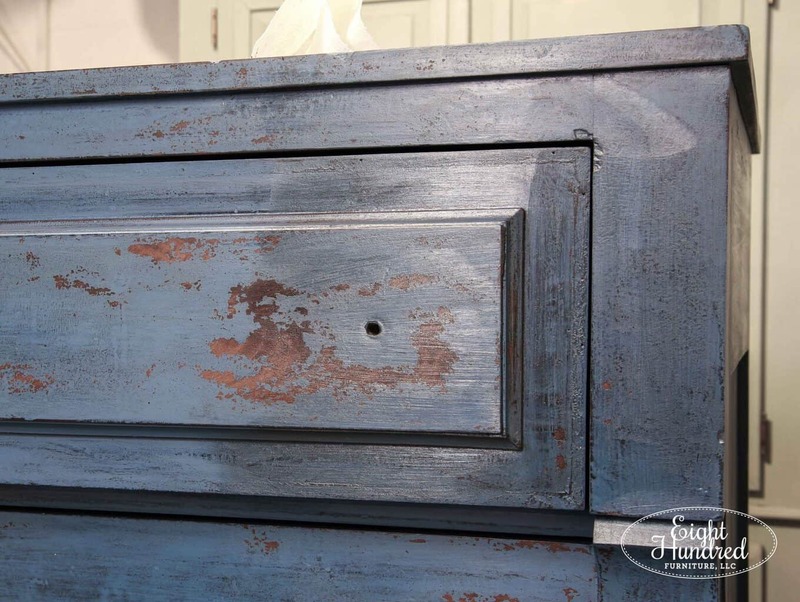 After seeing the “character” close-up shots of this dresser, I feel 100% inspired to bypass sanding the gatored areas and go straight to painting! 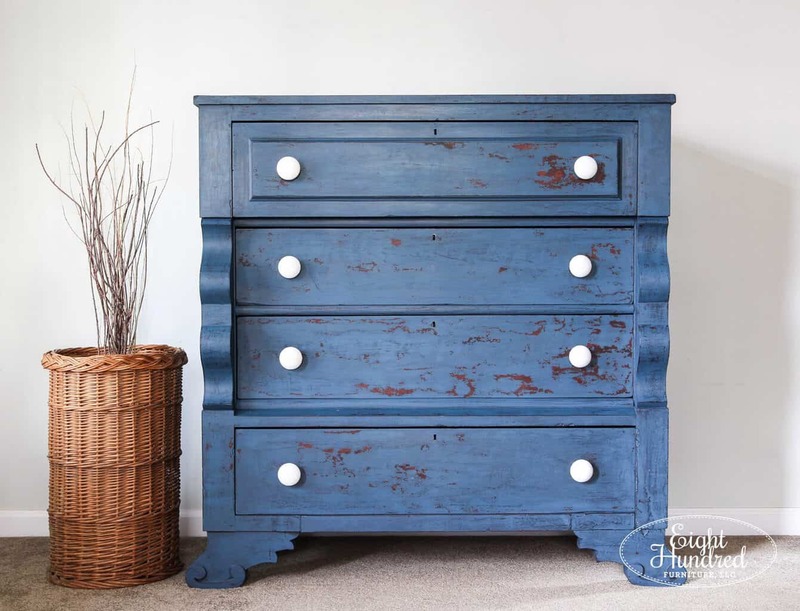 Thank you – for sharing your passion & experience; tips & processes; and for having the courage to show all the imperfections (aka beauty marks) which contribute to the beauty and one-of-a-kind[ness] of this dresser! There IS perfection in imperfection!